The Autumn Birds group flocked up the hill towards me, buzzing with anticipation for what the evening may hold. Brimming with badger and pine marten trivia, and anxious not to disappoint on the first hide visit that I had ever run, I waited. The evening certainly did not let me down. As we stood in the fading light outside of the Magnus House, sharing news of the day’s fantastic wildlife sightings, we witnessed our first nocturnal hosts; bats! They swooped past along the path and tree line, carrying out daily commutes between hunting grounds and roosts. Five species of bat have residence on site: Natterer’s (Myotis nattereri); Brown Long-eared (Plecotus auritus); Common and Soprano Pipistrelles (Pipistrellus pipistrellus & P.pygmaeus); and Daubenton’s (Myotis daubentonii). Some lucky individuals seemed to have discovered the delights of the moth trap set that night at the edge of the woodland, and were taking advantage of the insects that were circling the light in misplaced navigation attempts. The calls of migrating Pink-footed Geese (Anser brachyrhynchus) rang above as they filled the autumn sky in their triangle formations. At this time of year, they can been seen in their thousands on local mudflats and grazing fields. Barely had we all settled down in the hide, when bounding towards the feeders came our first visitor, a pine marten. I recognised her bib; Polly, a rescued orphan released on site the previous year. 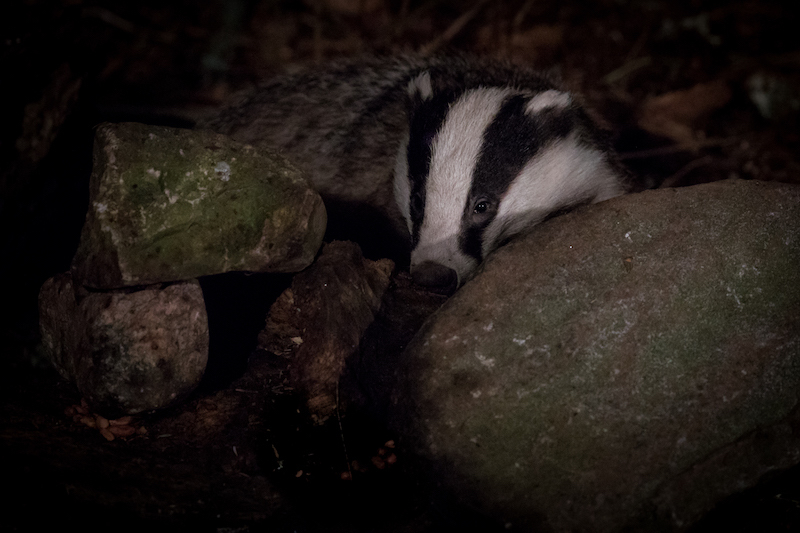 Much to our delight, she put on quite the show, munching down not only most of the pine marten bait, but also some of that intended for badgers. She stayed for over twenty minutes before the unexpected bleat of a nearby sheep caused her to slink away into the darkness. Calls of the night filled the air; the deep husky barking of a young red deer followed by the sombre hoot of a tawny owl, perhaps one of this year’s fledgelings. Moments later a badger scampered its way into view carelessly tossing aside stones to inhale its food. As winter is rapidly encroaching on nature, both the pine martens and badgers are desperately stocking up. This was evident that night when less than half an hour later I was saying “Ok everyone so the bait has been polished off… we may not attract in anything else this evening, but I’d call that a pretty successful evening”. Of course, everyone left delighted with what they’d seen, and turned in for an unexpectedly early night. For some it had been their first viewing of Scotland’s wonderful nocturnal wildlife, as it had been for me only a few weeks previously. Written by Academic Placement, Jessica Stokes. 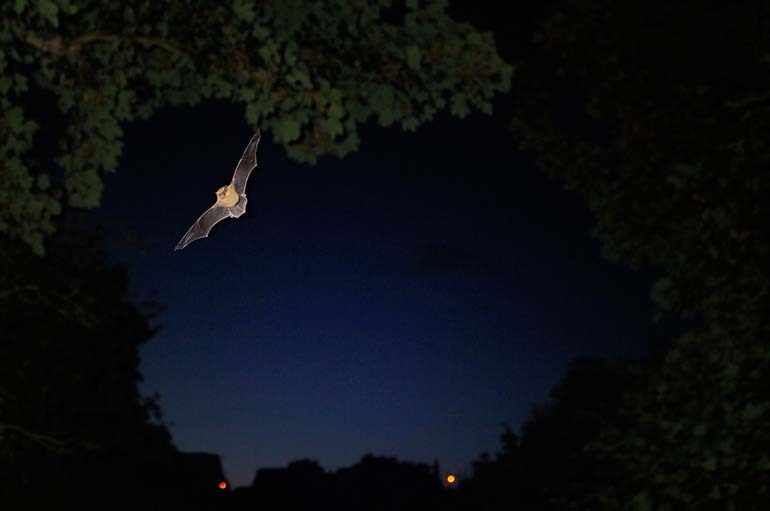 Image of pipistrelle bat by Laurie Campbell. 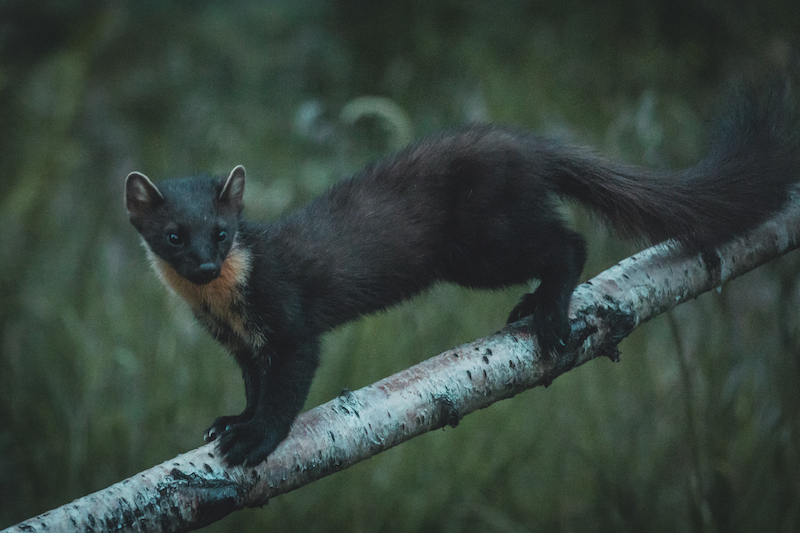 Images of badger and pine marten at the Aigas hides by Pete Short.